Sometimes a picture says it all. 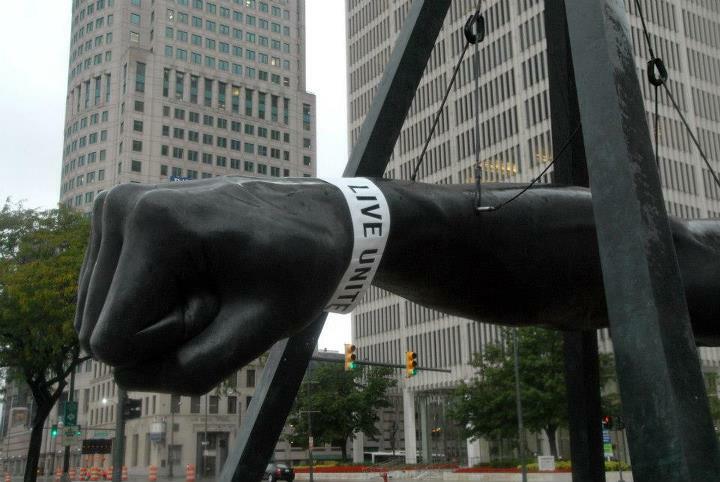 “The Fist” is a memorial to boxer Joe Louis by Mexican-American sculptor Robert Graham that rests at Hart Plaza in Detroit. The sculpture was commissioned by Sports Illustrated magazine and dedicated on October 16, 1986. Depicting a 24-foot-long arm with a fisted hand suspended by a 24-foot-high pyramidal framework, the sculpture represents the power of Louis’ punch both inside and outside the ring. Because of his efforts to fight Jim Crow laws, the fist was symbolically aimed toward the South. Last Friday, we launched this year’s United Way campaign with a torch lighting ceremony right across the street from The Fist. As I walked back to the office through the rain, I looked over and saw the sculpture wearing a “LIVE UNITED” wrist band. In a world that seems to be driven by matters on which opinions diverge, I thought this photo spoke to the need to find common ground even when we disagree. How to give a killer gift? The 4 Things a Leader Often Won’t Admit?